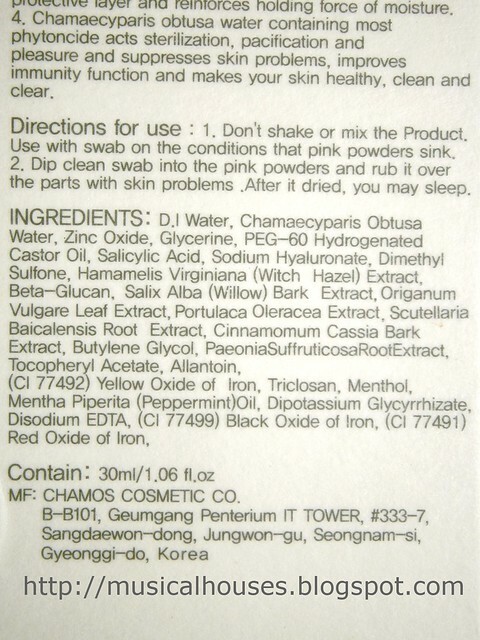 I've recently found out about the Korean skincare brand, Chamos, and one of the products that intrigued me was the Trouble Skin Solution Magic Powder. As you might guess, I have pimples (don't get me started, now), so any pimple product that claims to do wonders for pimples is definitely something that would be up my alley. Now there is a Chamos English website based out of Singapore with perfectly gramatical description, but it was the funny Korean translation on the Chamos Korea site that caught my attention - "It is a 2-floor skin trouble product that improves skin troubles instantly". 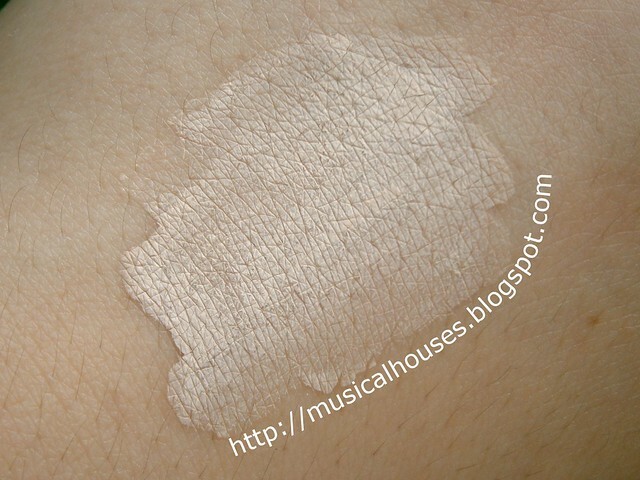 2-floor skin trouble product? Well, I'm not quite sure exactly what that meant, but sign me up! Turns out, the Trouble Skin Solution is a product with two phases - a liquid phase, and a solid phase, which is a pink "Magic Powder". It actually looks super cool in the bottle, and reminds me both of Mario Badescu's Drying Lotion, and calamine lotion. It actually looks really cool in the bottle. So here it is, with a cotton swab dipped in. The powder kind of clumps to the cotton swap, making this huuuge ball of powder-and-water in the product...It is quite fun to watch, actually. This is the amount of product you actually get out per dip with the swab. A lot of the powder actually doesn't make it out of the water, so that big clump you see becomes a managable dollop of powder mixed with watery liquid. Cool right? 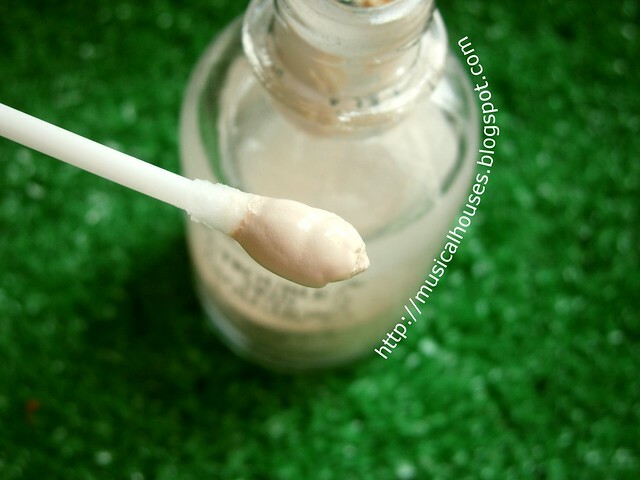 From there, I just apply it directly to my skin, using a new swab whenever I need to get more product out of the bottle. I think it's more hygenic that way. Here is the product applied on the back of my hand, while it is still wet. 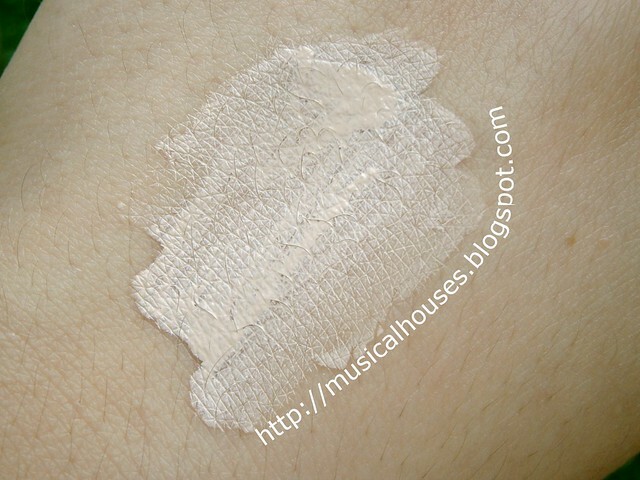 Doesn't it look exactly like calamine lotion? It feels like that, too. 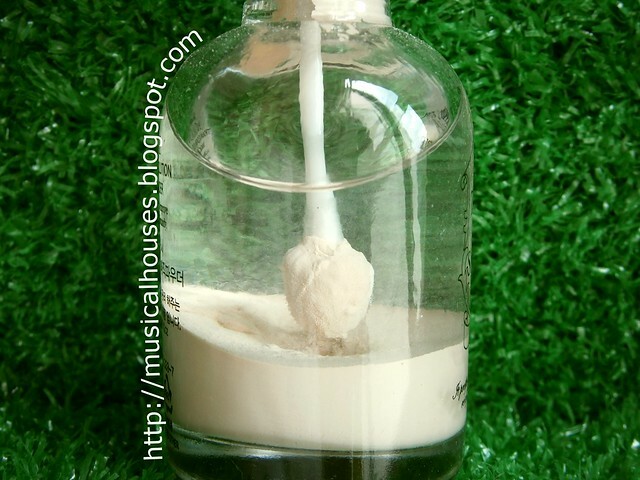 Once applied, it feels a little like calamine lotion, as there is a cooling sensation that feels pleasant on the skin. The instructions for use say that you should wait tl the powder is dry before sleeping, and that usually isn't a problem as the product dries quite fast. After a couple of minutes, it's dry. As you can see in the photo below, the product just kind of dries up. I think the powder falls off, though. When I wear this to sleep, and I wake up in the morning, I don't see any powder on my face - I'm guessing it all rubbed off on my pillowcase! When I used the product, I had both huge cystic pimples and smaller "normal people" ones. For my huge cystic acne bulbs under my skin, I felt like the product helped somewhat, but not enough to wow me. Then again, cystic acne can be a tough nut to crack, and very few over-the-counter products have really helped my cystic acne. But, for the average pimples, I found that it helped manage the smaller pimples. 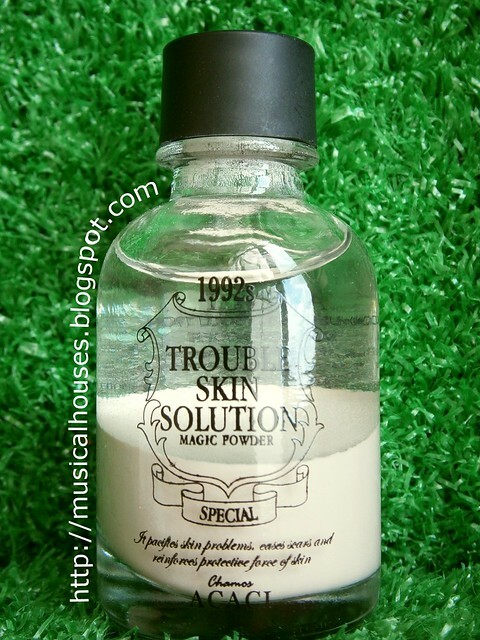 I also found that the Trouble Skin Solution helped to calm down my prone-to-pimple areas, without drying them out. So overall, I was still quite pleased with the product. Looking at the ingredients, I can see why. The Trouble Skin Solution contains main ingredients with antiseptic properties (Zinc Oxide, Salicylic Acid, Witch Hazel Extract) as well as ingredients that moisturize the skin (Glycerine, Sodium Hyaluronate), so this explains why it does help my pimples without drying them out. There are also lots of plant extracts (Japanese Cypress, Wood Fern, Willow Bark, among others), and some of these have a calming effect on the skin. Also, there weren't any obviously pore-clogging ingredients in the product. So, I felt that the product was well-formulated. Below, you can see the full lists of ingredients. I also think that if you are a fan of the much-raved Mario Badescu Drying Lotion, you'll probably love this as well - it's similar in terms of appearance (powder suspended in watery liquid), as well as in formulation, as some of the active ingredients are the same (zinc oxide, salicylic acid). From a cursory reading of the ingredients lists, I guess the main difference is that the Chamos product includes some plant-derived exxtracts, too. Mario Badescu isn't as widely available in Singapore, so for girls looking for an alternative to the Drying Lotion, this could be one to check out. So, would I recommend the Trouble Skin Solution? If you have skin that's prone to blemishes, or small to normal-sized pimples, this product will probably help. It does help to keep blemishes away, and helps to prevent blemishes and milder acne, without drying out the skin. It could probably also help to prevent acne before it comes up. Perhaps the only caveat I'd make is that for severe cystic acne, you'd probably need to use this in conjunction with something stronger. of this bottle is magnificent! Yea, could you please tell us where can we get this?